These are proving to be our most requested party/function. 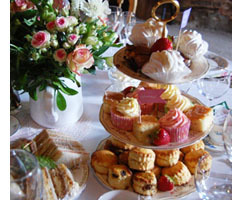 A speciality tea suitable for not just a wedding but for all occasions. Using sourced Vintage China, tea cups and saucers with matching plates. China three tier cake stands and tea pots, milk jugs and sugar basins with silver tongs for your cubes of sugar. Our vintage china is also available for hire. This will give you a ‘wow’ factor for any special day! A very traditional, quintessentially English ocassion. Hog roasts and BBQ's are available.